The Dan D'Agostino Progression monobloc is an absolute beast | What Hi-Fi? The Progression Mono Amplifier delivers 800 watts into 8 ohms and costs $45,000 per pair. Dan D'Agostino unveiled its newest range of Progression amplifiers at CES 2016, with the Progression Mono Amplifier the first from the line-up. The Mono Amplifier is huge. It's the company's largest and most powerful amplifier to date, delivering a monstrous 800 watts into 8 ohms. That means it doubles to 1600 watts into 4 ohms, and even further to 3200 watts into 2 ohms. Inside, there's a fully complementary driver stage, with 84 output transistors, a 4000 VA power supply transformer, and 400,000 microfarads of power supply storage capacitance. The Progression range will also include a stereo amplifier, a stereo preamp, and a lifestyle amplifier similar to the Momentum range's equivalent. The iconic power meters from the Momentum series were one of the range's highlights, and happily the stunning design has been incorporated into the Progression monobloc, too. The power meter on the Progression is a new design: apart from being much bigger than on the Momentum amplifiers, it has a longer 270-degree needle swing driven by a high-speed ballistic circuit that allows the needle to cover the amplifier's higher output range. It still glows green, though. The venturi heatsink design - also from the Momentum amplifiers - are present, with a second row added to aid the Progression's cooling needs. "With the Momentum series amplifiers, I focused on combining high power output with a relatively small form factor. 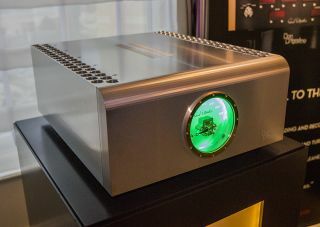 But I knew some of our customers had a desire for a larger, more powerful amp at a somewhat more affordable price," said founder and chief engineer Dan D'Agostino. "That's why we created the Progression series." Sounds perfectly agreeable to us. The Progression Mono Amplifier will cost $45,000 per pair, comes in black or silver finishes, and is due out in the first quarter of 2016.